A set of new applied subjects to be introduced in schools will give young people a head start in figuring out their interests, beyond traditional academic disciplines, said parents and teachers. Seven new subjects will be offered over the next two years. 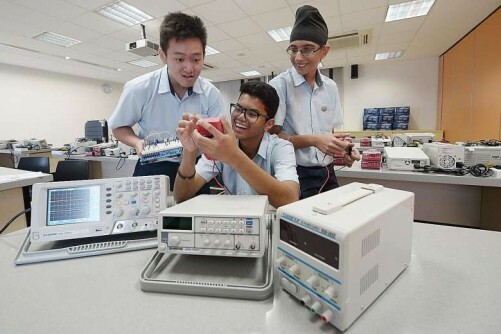 Electronics and computing for O-level students will start next year, along with three Normal (Technical) level subjects - smart electrical technology, mobile robotics and retail operations. In 2018, drama, as well as exercise and sports science, will be offered at O level. Mr Billy Ng, 54, who owns an IT consultancy, said his Secondary 1 son would enjoy electronics and computing. "Since primary school, he's been into gadgets, technology and programming." National Institute of Education (NIE) don Jason Tan said the new subjects are in line with the SkillsFuture movement to encourage students to discover their interests, especially in applied learning. "The range of subjects sounds in tune with some of the polytechnic and Institute of Technical Education (ITE) courses, and these will give students a head start in preparing for post-secondary education," said Associate Professor Tan. He also said it is good that some subjects cater to Normal (Technical) students. "It will be helpful for them in deciding which courses to take in future." Mr Ravintharan Palanisamy, who will teach mobile robotics next year at Woodlands Ring Secondary School, said: "We hope to make the subject come alive so that students will be enthused and pursue related courses later on." Secondary 2 student Zikry Izzaniq Azizan from Hong Kah Secondary, who hopes to take electronics next year, said: "In primary school, I took part in a robotics workshop and started to like electronics." The 14-year-old, who wants to study engineering at a polytechnic, said: "Hands-on learning gives more focus than just reading textbooks." In addition, secondary schools work with post-secondary institutions to offer shorter courses in applied topics. For instance, more than 6,000 students have taken advanced elective modules (AEMs) - offered by the polytechnics to give Express and Normal (Academic) students a glimpse at practical training through laboratory sessions and workshops by poly lecturers. The AEMs began in 2006 with about 200 students. Now, there are about 150 modules to choose from, in areas such as hospitality, aerospace and digital animation. Since 2007, about 5,400 Normal stream students have also taken up elective modules offered by schools together with the ITE. There are now 31 such courses in areas related to science, technology, engineering and mathematics. The modules can count towards credit requirements when students join the ITE.